I first picked up a copy of this excellent book by Kim Field shortly after the updated edition was published by Cooper Square Press in 2000. At that time I was only interested in the blues, which meant half the content went unread. But this is a goldmine I keep coming back to. As my appreciation of all things harmonica matures, so Kim Field’s work garners greater relevance. 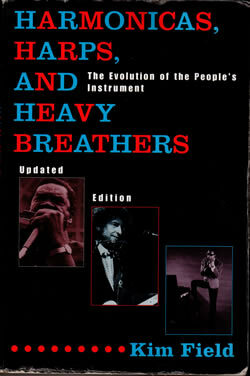 It should be stressed that the emphasis of Kim Field’s research is on the North American harmonica heritage, although the UK’s Tommy Reilly is awarded five pages in the Classical Music chapter and there is brief mention of the burgeoining British bands of the 1960s in the Rock and Roll chapter. Nonetheless, Field’s work combines the best aspects of a good read and a very handy reference resource. There are twelve chapters in all, plus an intriguing epilogue and afterword. 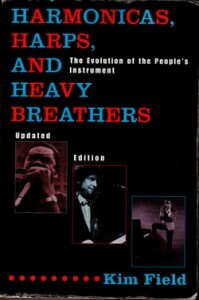 In the opening chapter, Field charts an ancient journey from the South East Asian roots of the free reed instrument family to the harmonica’s eventual landfall in the USA.